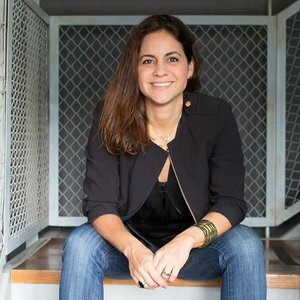 Andrea Siqueira is Executive Creative Director at Isobar Brasil. Before, she was the Creative Director at Africa Zero, a project of Africa, Brazilian agency named International Agency of the Year in 2014 by Advertising Age. Together with founders Nizan Guanaes, Marcio Santoro, Sergio Gordilho and her team, Andrea Siqueira leaded the creative work that helped the agency grow from 0 to 14 clients in 2 years. At Africa Zero she was responsible for successful campaigns for clients such as Bimbo (largest baking company in the world), Embraer, Braskem, Movile, Bacardi, 99Taxis, among others. For Bimbo, besides the local work, they also won the pitch, created and produced the 70-year-campaign for the Mexican and US market. Andrea started her career 16 years ago with Guanaes at DM9DDB as a copywriter. Then, she moved to JWT where she became a creative director for Nestle, Nokia, Sunsilk, Bayer and Johnson&Johnson and acumulated international experience leading creative work in Brazil and US and Europe. Along her career, Andrea has won Cannes Festival, D&AD, Clio, Fiap, NY Festival, and almost every important award in the Brazilian advertising market. In 2015 she joined the One Show Festival as a Film Jury. She also attended Kienbaum Leadership Courses in 2015.